Along a rural stretch of public road in south-central Florida, a heavy-duty truck recently drove itself for 7 miles with nobody on board the vehicle. It was one of a series of test runs autonomous truck startup Starsky Robotics completed Feb. 16 and 17 with a Class 8 Freightliner tractor outfitted with its self-driving technology. The truck completed its 7-mile run on the second day, a day after logging 2- and 5-mile unmanned drives in what the company said were the first such tests conducted without a backup driver in the cab. For each run, the truck traveled without a trailer. The tests were conducted on a closed-off section of County Road 833 in rural Hendry County, near Lake Okeechobee just outside the Everglades. The truck was monitored by a “remote driver” from an office roughly 80 miles away in Plantation, Fla., viewing video feeds from the truck’s onboard cameras, the company said. While 7 miles is hardly a longhaul truck route, the technology developer believes this test will pave the way for unmanned trucks to begin hauling freight earlier than many in the industry think possible. Founded in 2015, San Francisco-based Starsky hopes to address the trucking industry’s driver shortage by moving them from the cab into offices, where they can monitor and remotely control trucks. Technology developers including Uber Technologies Inc., Embark and tuSimple also have been testing self-driving commercial vehicles, but thus far continue to keep a backup driver in the cab during on-road operation. Starsky chose Florida for testing due largely to the state’s permissive autonomous vehicles laws; it does not require a human operator be present in the vehicle for testing purposes, nor require any special permits. For last month’s runs, Starsky worked with county officials to close off the road used for testing. Over the past year, Starsky said it has been using its self-driving trucks — with a person onboard — to haul commercial freight ranging from 5,000 pounds of milk crates to 40,000 pounds of tile. 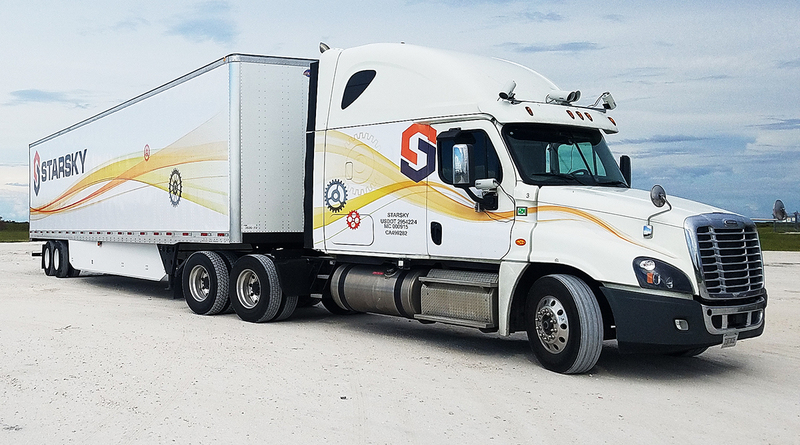 In September, after Hurricane Irma hit southwestern Florida, one of the company’s self-driving trucks participated in recovery efforts by hauling water 68 miles across the state without the in-cab driver needing to intervene, the company said. Starsky plans to begin using unmanned trucks to haul freight sometime this year, Seltz-Axmacher said. However, regulatory differences among states mean that those unmanned hauls will for now be limited to intrastate operations. “We’ll be focusing on some of the early adopter states which are making it very easy to do autonomous testing,” he said. Starsky uses onboard cameras and radar to track the truck’s surroundings. The remote drivers can use a steering wheel at their desks to take control in certain low-speed operations, such as moving trailers around a yard. Highway driving, however, is a poor application for direct remote control, Seltz-Axmacher said. At those speeds, the company uses “supervised autonomy,” in which the remote driver makes high-level decisions which are carried out by the truck. For example, the truck may depend on human judgment to ensure that conditions are safe for a lane change. Once the remote driver indicates that it is safe, the truck will execute the lane change on its own. Remote driving also can help autonomous trucks handle tricky driving situations, Seltz-Axmacher said. In one case from the September run, a fire truck was parked at an intersection with a stop sign, and a firefighter was in the road waving traffic on. Here, the remote driver safely maneuvered around the fire truck, and the drive continued. Starsky is not the only company developing remotely controlled vehicles to move freight. Sweden-based startup Einride plans to begin moving cargo there later this year with unmanned vehicles that have no cab or driver’s seat. The company plans for remote drivers to monitor these vehicles and control them if needed. Starsky recently closed a $16.5 million round of funding led by Shasta Ventures. Previous investors, including Y Combinator, also participated. Starsky currently has 21 employees and is operating two test trucks, but plans to expand its fleet and staff this year.